The global economic crisis has afflicted Persian Gulf states that have incurred significant leverage to finance massive infrastructure projects and overseas acquisitions. The potential global ramifications of this phenomenon have now unfolded, with massive falls in equity markets across the world in the wake of Dubai’s government seeking a suspension in payments on almost $60 billion in sovereign debt. The credit default swaps on Dubai’s debt immediately climbed by 90 basis points, as investors staggered at the prospect of a major sovereign debt default. Other Persian Gulf emirates may also be at risk. However, the Gulf is only one region that is seriously exposed to the prospect of sovereign debt default. Much of Eastern Europe is financially under water. Ultimately, however, the worst case scenario by far is debt default by the United States federal government. With the U.S. government projecting structural mega-deficits for at least the next decade, can it be safely assumed that Washington will not follow in the path of Dubai? The economic metrics are truly surreal. The Dow Jones and other equity indices are soaring to the skies, while Wall Street boasts about its executive bonuses, which are at record levels. 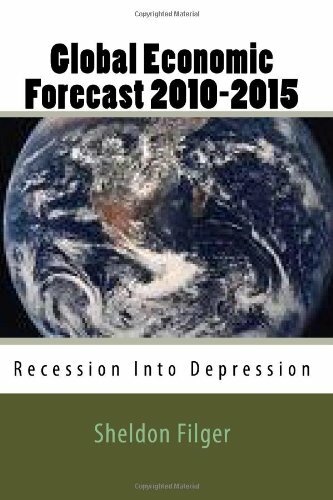 Amid the obvious creation of a new asset bubble, courtesy of the U.S. Federal Reserve and other central banks, coinciding with a return to megalomaniacal arrogance by the titans of finance, the real economy continues to plummet, despite claims that many economies have retuned to positive GDP growth. But with unemployment at record levels and continuing to grow, it is clear to many that the so-called economic recovery is based on a facade of fragility. It may take only one major international crisis to collapse the global financial house of cards. In case you have not noticed, Iran is going full steam ahead with its opaque and ambitious nuclear program. Israel has continued to hint that time is running our for a peaceful resolution of the controversy over the Iranian nuclear program, which it suspects is a covert atomic weapons program, aimed ultimately at them. However, the rhetoric from Israel has been toned down somewhat of late. That, in my opinion, is not a good sign. While the Israelis were loudly engaging in military manoeuvres suggestive of preparations for an attack on Iran, it was clear that this was a psychological game, aimed at putting pressure on Tehran and the international community. It is when the Israelis become quiet over what their military is preparing for that the world may be about to experience a surprise Israeli attack on the Iranian nuclear facilities. This would clearly spark a regional conflict, which will likely involve the United States, which now has military forces deployed on two different frontiers with Iran. A regional conflict in the Middle East, beginning with a military exchange between Iran and Israel, could be the kiss of death for the global economy. Imagine another interminable conflict in that volatile region, with the major chokepoint for oil exports from the Persian Gulf to the primary industrial economies, the Strait of Hormuz, being interdicted by Iranian missiles. Oil prices would soar beyond their historic highs, sending the current false economic recovery into an authentic global depression. The world may be just a single regional war short of a full-throated economic meltdown, and that fearsome war may be coming to a theatre near you, sooner than anyone can imagine. Clearly, Chinese decision makers are increasingly viewing America’s monetary polices as utterly reckless. Given that China is now the largest holder of U.S. Treasuries, it would be unreasonably optimistic to expect Beijing to continue purchasing U.S. sovereign debt indefinitely, and at historically low rates of interest. What happens when the Chinese authorities begin moving away from the dollar? In my view, nothing good for the U.S. economy, especially as it sinks ever deeper into debilitating debt. I have previously predicted that the Obama administration will almost certainly push for a second stimulus package prior to the 2010 mid-term congressional elections. The upcoming White House jobs summit, scheduled for December, is probably a set-up to create the PR context for promulgating a new instalment of the previous Economic Recovery Act. In a recent op ed piece, NYU economist Nouriel Roubini warned that unless “bold action” (meaning more stimulus spending ) is taken, “the damage will be extensive and severe unless bold policy action is undertaken now.” He rightly fears that a continuing growth in the unemployment rate, which he believes will top out at 11% according to U3 measurements, will likely send the U.S. economy back into another recession, the feared “double dip” or W recessionary curve. Of course, Roubini is correct. But as he himself has previously pointed out, the growing deficits and national debt of the United States in itself is a growing danger to the nation’s long-term economic future. With a staggering national debt, I do not believe the U.S. can absorb the additional debt load required to fund another stimulus package. Irrespective of fiscal realities, however, political expediency will undoubtedly triumph. Which means a new stimulus bill will be approved by Congress in 2010, a few hundred thousand temporary jobs may be created, but when the next banking crisis arises (and it will) a fiscal disaster will confront the U.S. economy, more than wiping out any small gains in employment that will result from allocating several hundred billion dollars of borrowed money for President Barack Obama’s version 2 of stimulus spending. The Obama administration has announced that it will be conducting a White House conference on job creation in December. This upcoming employment pow-wow apparently was sparked by the continuing rise in U.S. unemployment numbers combined with a decline in polling numbers favourable to the Democratic Party. President Barack Obama made a critical strategic error, in my opinion, when he selected Clinton administration retreads and Bush administration continuity to frame his economic agenda during his first year in office. Larry Summers, Timothy Geithner and Ben Bernanke are the hand maidens of Clinton and Bush administration deregulation that crippled America’s financial system. Yet, it is precisely these minions of economic disarray that Obama selected as the saviours of the U.S. economy. It is as though the ex-CEO of Enron was pulled out of prison to head the salvation of General Motors. The clique picked by Obama to head economic policymaking has done what would be expected of them. They have sacrificed the real economy to backstop Wall Street, socialize its losses incurred through its unique brand of casino capitalism, and inflate a new equities asset bubble. Grow the bubble big enough, they must think, and eventually the unemployment numbers will recede. Economic mythology is now being confronted by political reality. The so-called jobs summit has an air of desperation about it, as the Democrats begin to contemplate the loss of Congress in the 2010 mid-term elections. The next step will probably be a second Obama economic stimulus program, which may temporarily bring about a slight improvement in employment numbers, but at the cost of a further deterioration of America’s already bleak public fiscal posture. This will further weaken the dollar, which undoubtedly will bear political consequences in the 2010 mid-term elections. Obama may be in for a bitter surprise in the second half of his presidential term. In an earlier post, I reported on the statement Chinese premier Wen Jiabao made at a press conference regarding his anxiety over the security of his nation’s vast investments in U.S. securities due to Washington’s wild and crazy fiscal policies. Well, it appears that his nervousness regarding the United States economy is growing rather than receding. With the value of the U.S. dollar continuing to plummet as gold prices rise, and America’s massive deficit spending continuing unabated, I wonder how China will react when the Obama administration decides on a new stimulus spending package, as will almost certainly be the case in early 2010. Perhaps Beijing may be reluctant to continue acting as Washington’s revolving credit card. But without China’s largesse, who then buys U.S. Treasuries, and most importantly, at what bond yield? I believe that the days when Washington could fund its deficits at absurdly low interest rates may be about to leave us for good. The zombie automotive behemoth that is General Motors would have been long buried but for the intervention of the U.S. government and massive infusions of cash, borrowed by the overleveraged American taxpayer. Supposedly, in exchange for taxpayer support, GM was supposed to downsize and focus and a few core U.S. brands. Part of this restructuring was the elimination of foreign brands, the largest being European-based Opel. After months of negotiations, a consortium led by the Canadian automotive parts firm Magna International Inc., also involving a Russian bank, with significant financial support from the German government, was on the verge of buying Opel from GM. The legal papers were ready to be signed, but now GM’s management and board of directors have had an about face. The surprise decision, made at the last moment, to scuttle the carefully crafted deal worked out by Magna, was based, so says GM, on a more positive outlook for their business. Hours after the decision was made, GM also announced it was axing 10,000 Opel employees, sending the workers of the firm’s German factories on strike. What we have here is an impulsive, instinctive example of flawed corporate decision-making, choosing to discard the months of international negotiations for a sale that would have taken Opel off of GM’s back and balance sheet. Instead, we have a clique that wants to hold on to the fantasy that GM remains the world’s largest automaker. As for the U.S. taxpayers who will be the ultimate losers, the “new” General Motors couldn’t care a wink.